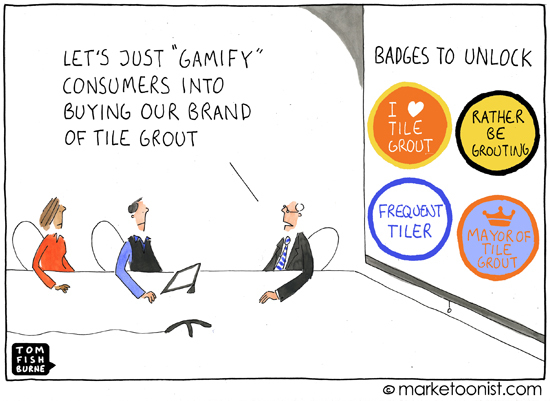 The gamification bandwagon continues, promising customer engagement and loyalty. What some marketers miss is that gamification means a lot more than badges, points, mayorships, and leader boards. Those game mechanics don’t necessarily create experiences worth playing. If you build it, they won’t necessarily come. 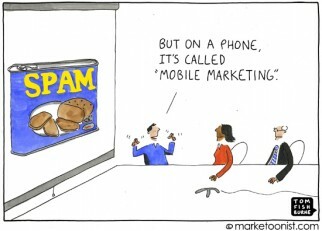 More importantly, gamification can’t make an un-engaging brand engaging. It may be the shiny new thing, but it’s not a silver bullet. Game mechanics are enablers to big ideas. They aren’t the big ideas themselves. I enjoyed the recent Pinterest campaign from Peugeot. 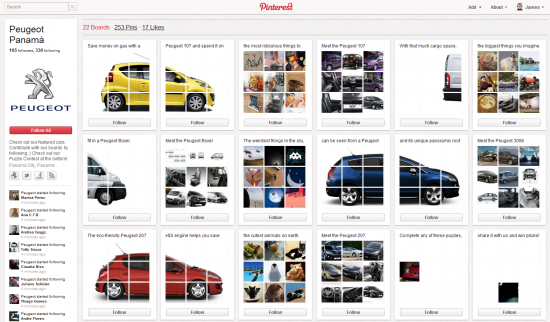 Peugeot wanted to interact with its Pinterest community, so they created puzzles and scavenger hunts that use the Pinterest platform to complete the puzzles. What I liked about the idea wasn’t about the game mechanics. There were no badges to unlock. It was just about an engaging experience for the Pinterest community. For every Peugeot that gets it right, there are many marketing campaigns that use games for game’s sake. You summed up in one paragraph, which helps in brands understanding how to make use of “Gamification”. Thanks so much, especially for the Pinterest pointer (who, unfortunately, in their most recent redesign, destroyed people’s board tile art): I always like to compare and contrast Pinterest to Lockerz: On the surface, both serve the same needs and deliver the same functionality, but Lockerz overtly “gamifies” everything, whereas Pinterest just makes it easy and explorable. And now look at the stats of both. Games are fun when they are well-designed and competitions are fun when you know in advance what the prizes are …..which you don’t in this one? Good to see a brand jumping in to Pinterest in such a creative way however. I searched in vain for who did this – Peugeot or one of their agencies? Anyone know? Love the “Rather Be Grouting” badge btw – I dare a Grouting manufacturer to run with this campaign…..! 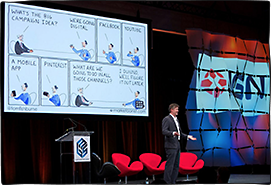 I agree with the idea that gamification is being misused by mindless brand communications. But I think your cartoon is not quite accurate. There are surely groups of people who would enjoy the gamification of grout. Particularly people who define their identity based on their handiness… whether they’re professional home-builders (or sub-set) or amateur DIY’ers. It’s entirely possible for a quality grout brand to energize and grow its user base by having fun with badges-of-pride. The idea of personalized social marketing is that I, as a human being with unique wants and identity quirks, am able to satisfy my individuality and show it off in a fun way. And you, as brand or product are now able to interact with me in a way that lets me ‘do my thing’ in a fun way while you get the word out about how you help me do my thing in a fun way. Grout badges may do exactly that. Sebastian’s quote sums it up best “games are not fun because they’re games, but when they are well-designed.” That also holds true for skill-based contests and competitions. 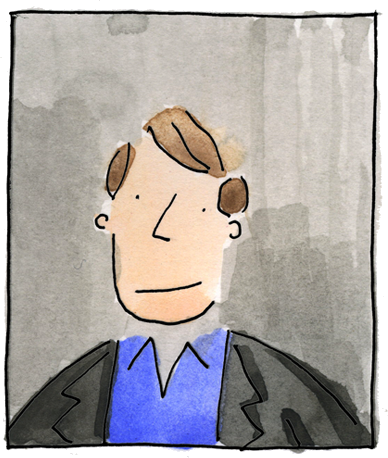 @Tom and @Scott–in principle yes I’m sure that there are a few grout aficionados out there, but I think Tom’s cartoon is still accurate since the characters are approaching gamification from a position of inflated expectations and misapplication, if not simple ignorance. 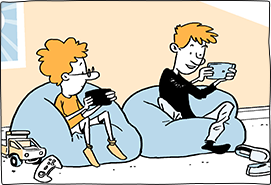 “Let’s just ‘gamify’ our consumers into buying our brand” drives the satire home! 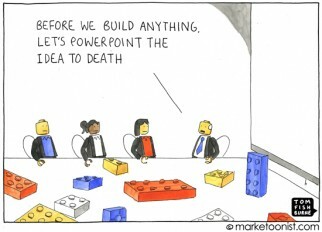 I’m buying the license on this one for my preso. Good stuff!